1) Know how to correctly identify the plant you plan on finding. 2) Know where to look to find the plant. 3) Know how to correctly prepare the plant for consumption. This article will teach you how to accurately and EASILY identify these 5 plants. 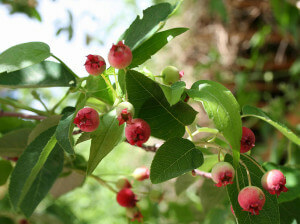 These plants have been chosen because they are very common in the Northeast in the spring, so finding them should be EASY and they require NO preparation before consumption, they can all be eaten raw and are generally good tasting. Although this article focuses primarily on the Northeastern region of the United States, the information is here is valuable to people worldwide because these plants or their close relatives grow in temperate climates around the world. Japanese Knotweed is often called Japanese Bamboo because it looks like bamboo. 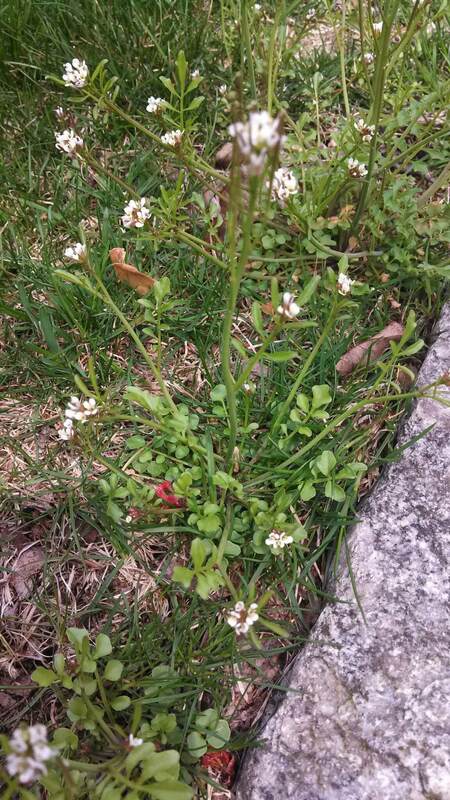 This plant sends up shoots during the spring, usually some time in April in the Northeast. It is extremely invasive so can be found locally almost anywhere in the Northeast. As Mentioned above Japanese Knotweed looks like bamboo. it has visible nodes(dark ring around stalk) every 8″ or so. 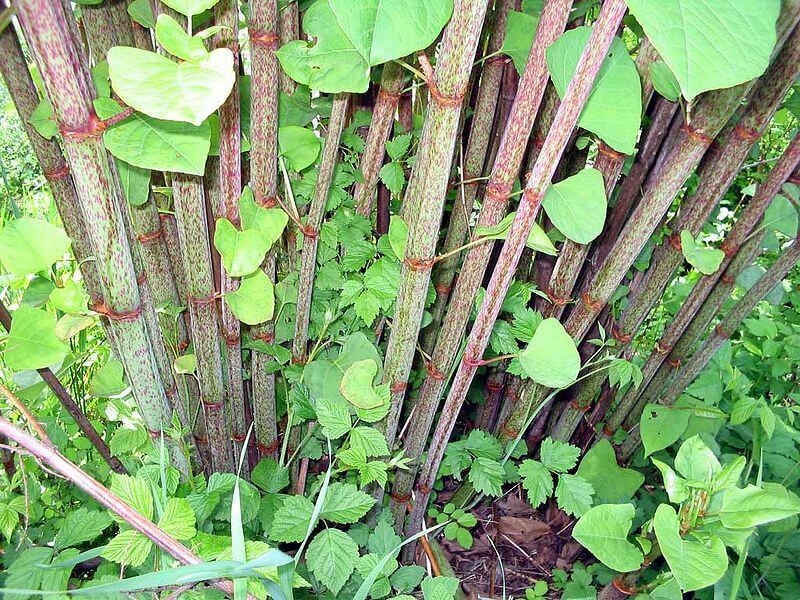 When it comes up in the spring it is usually part of a larger grove of Knotweed sending up many shoots of varying heights each about an inch in diameter, when summer approaches the maximum height will be somewhere around 6′-8′. True Bamboo is also edible, but Japanese Knotweed tastes much better. The primary way to distinguish Japanese Knotweed from Bamboo is it’s leaf shape. Japanese Knotweed has a wide leaf, the length is about twice the width. True Bamboo has very narrow leaves, the leaf length can be anywhere from 4-8 times the width. Japanese Knotweed is an invasive weed in many parts of the United States, to see a map of its range CLICK HERE. It favors stream beds and moist soil. Take a 15 min ride around the nearest suburb and it’s likely that you will find this plant. The stalk is the part most commonly eaten, it tastes similar to rhubarb. After about a month or so the stalks start to dry out, get much harder, and become inedible, so eat as much as you’d like when they are soft and bendable in the spring. There is a caution when consuming this plant, it contains oxalic acid which is also in spinach, broccoli, garlic, and many other common vegetables. People who are trying to avoid oxalic acid should refrain from eating this plant. To find out more about Japanese Knotweed CLICK HERE. These are some of the first flowers to pop up in the spring. In the northeast you can usually find them in early April. Violets are a small lawn weed. They range in color from white to blue to purple. They usually come up and flower before the grass really starts to take off so they are most visible when flowering in the spring. 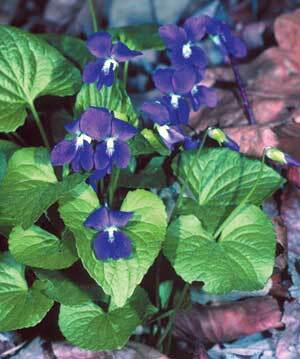 The best way to spot Violets are to look for these small flowers scattered throughout a lawn. The flowers usually do not grow in a dense mound but are more likely to be sparsley spread throughout an area. Once you have spotted the flowers take a closer look to confirm the identification. Violet flowers are unique, they have 5 petals, two on on each side of the flower and one petal on the bottom center which is usually colored or shaped different than the others. Pansies are in the violet genus and have the same flower shape, but are larger and easier to see. 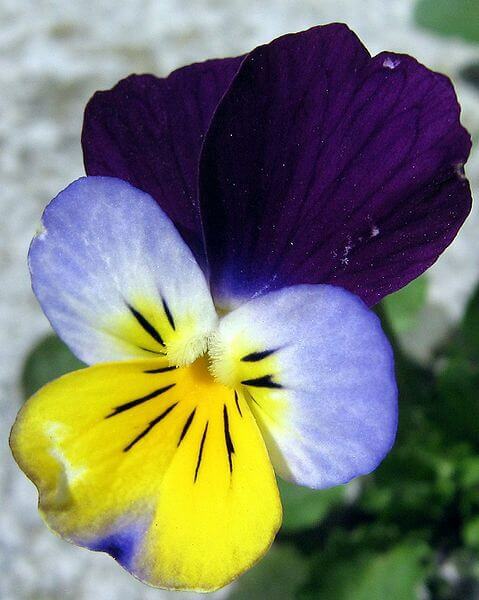 CLICK HERE to see a picture of a Pansy flower up close. Another identification feature is that Viola sororia has heart-shaped leaves that grow from a single bunch, they are typically lower than 4″ to the ground in spring but as they grow can reach to a height of 8″-10″. Violets stop flowering later in the year so keep an eye on where the plants are so you don’t need to try to re-identify them later. CLICK HERE to view the range of Viola sororia. The flowers and leaves are most commonly eaten raw. Edible flowers like these make an amazing garnish for salads or any other food where presentation is important. The leaves can be used as a lettuce substitute all year long, and may be more nutritional than some lettuces sold in stores. The leaves also contain mucilage which is considered to be a physically soothing substance especially for the throat. Also called crow garlic this is a naturalized wild garlic in the Northeast. This is not the same species as domestic garlic but it is similar. The best way to spot Wild Garlic is to look for their green tufts of foliage in early spring when many other herbaceous plants have not began to pop up. 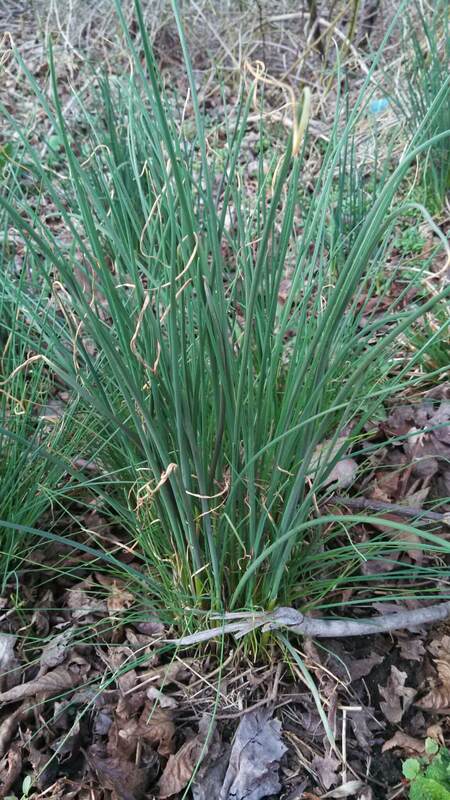 This is one of the first plants to start growing in the spring, but by summer it can get lost in tall grass and be hard to find. CLICK HERE to view its range. The genus Allium includes all garlic, onions, chives and shallots. Visually these can be difficult to tell apart from grass and other similar looking plants some of which are toxic, but there is one very important and reliable identification feature. All plants in the genus Allium smell like garlic or onion, crush up the leaves or bulb and take a whiff. Wild garlic is quite fragrant, so if you have smelled a suspected plant and still have a doubt then do not consume that plant. 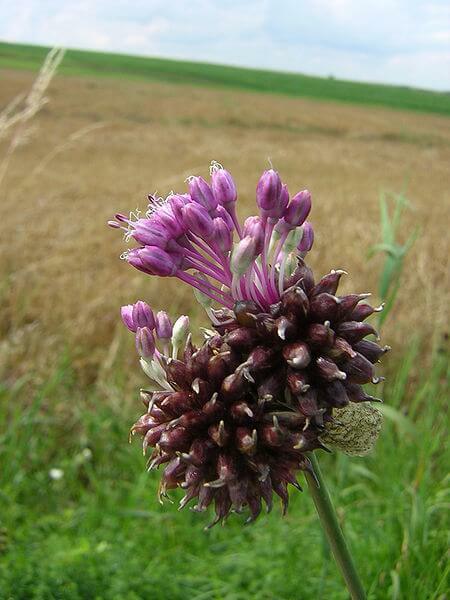 If it does clearly smell like garlic/onion then you have found a plant in the genus Allium and it is safe to consume. One more feature to notice about wild garlic which will help distinguish it from wild onion and some other Alliums is that it has a hollow tubular stem. All parts of all Alliums are edible and they grow all over the world, so this is not only a good edible locally but in many places worldwide. The bulb can be eaten like garlic, the leaves/stems can be eaten like chives. but there is one additional part to this species that is common. Bulbils are miniature bulbs that form at the top of the flower stalk in addition to or instead of flowers, this part of wild garlic is a great way to enjoy its flavor. CLICK HERE for a picture of a wild garlic bulbil. Despite the name Bittercress is not very bitter. 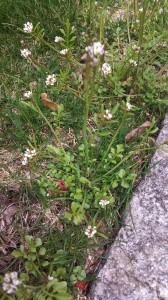 Bittercress is a small but very common plant in the mustard/Cabbage (brassicaceae) family. It grows in every state in the United States except for Arizona and Hawaii. 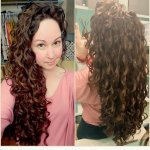 CLICK HERE to view its range. 1) Circular to 3-lobed small leaves toward the base of the plant which are arranged in a very orderly row along the stem. narrower leaves toward the upper part of the flower stalk which are also arranged in an orderly row along the stem. 2) Leaves and stems come from a single point. 3) Flower stalks with small white flower clusters which turn into small elongated seed pods later in the year. The best way to identify a plant like this is once you think you have found it, pull it up by the roots and bring it inside to compare to this picture or other pictures from credible sources. There is some misidentification from certain sources online so make sure you look at more than one. You’ve probably noticed by now that this plant is not massive. It is quite small, but what makes this a good edible is the numbers in which it grows. Once you have correctly identified one plant, look around there should be many more nearby. All parts of the plant are edible but the roots are not commonly eaten. This is a good plant to eat right on the spot as well as to collect and take back home, it is a great addition to salads, vegetable mixes or as a watercress substitute. There are a number of Serviceberries that are common in the Northeast including Amelanchier canadensis, Amelanchier laevis, Amelanchier arborea as well as hybrids of these and others. They all look similar, have edible berries, and are called Service Berry or June Berry. Ripening in June this is one of the first fruits in the year that are ripe enough to pick. 1) The berries look like blueberries but are redder, Amelanchier berries can be red, blue or purple. 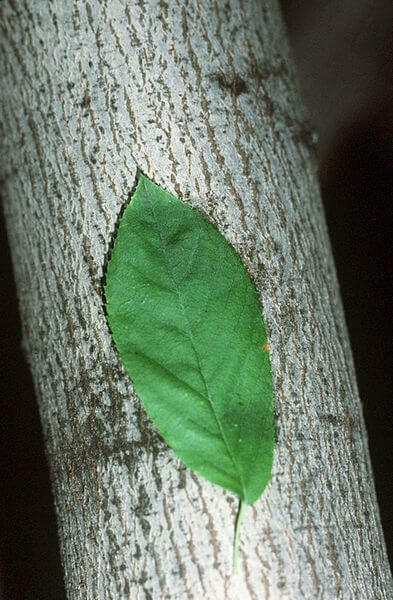 2) Notice the leaf shape, this shape is common for Amelanchier species, and the leaves have small serrated edges. 3) CLICK HERE to see a picture of the smooth silvery bark which is common for Amelanchier Species. 4) There is one more important identification feature which can be noticed in the fall and it is the long pointed buds of Amelancher species. As mentioned above this is a common landscape plant especially for parks and native plantings, so that is a good place to start looking. It is also a native forest tree/shrub but it is much easier to find in cultivated landscapes. 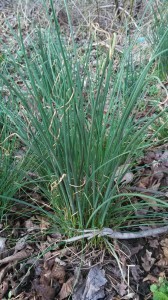 It can grow in medium shade and doesn’t get very tall. The maximum height is 5′-20′. There is a fungus that effects the leaves and fruit when planted near Juniper trees, this makes the fruit inedible but may help in identifying the plant. The berries are the only edible part of the plant and they are delicious. They taste similar to blueberries but have their own unique taste. You can eat them raw by the handfull, plants sometimes produce so many berries that the branches bend down from the weight. Please Share this article with your friends and family to help spread the knowledge of wild edible plants. Including wild edibles in our diets and eating with extreme diversity is better for our health and our planet. If you have any questions or comments then comment below or send a message to our facebook page which can be found by CLICKING HERE.